When summer is gone and the trails are covered with snow you don't have to put away your hiking boots & daypack. With the Cascade mountains to the west, plains to the east, and an annual snowfall measured in feet, Bend, Mt Bachelor, and the Central Oregon region are heaven for snow sport enthusiasts. With the addition of warm winter clothing, a pair of snowshoes and a set of poles, you can enjoy Bend, Sunriver, and other Central Oregon cities throughout the winter season. 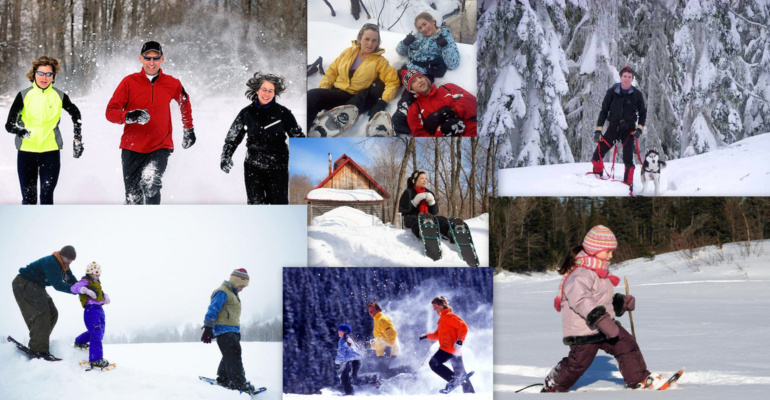 With the advent of smaller lighter snowshoes, snowshoeing is one of the fastest growing sports in America. This winter sport has no expensive lessons, lift tickets, or lift lines, and most people can get the hang of it with very little practice! Many weekends you will have the trail almost to yourself to enjoy the solitude and beauty surrounding you. If you like being in a group setting check out the local Mt Bachelor snowshoe tours for guided adventures. Getting started it easy: go to a local snowshoe rental shop and rent a pair for about $15 a day. Dress for the cold and remember that for most people, a short, easy summer hike (Virginia Meissner) is a moderate snowshoe hike. Tumalo Mountain or Vista Butte is a perfect place to start - where on a clear day you have excellent views of Mount Bachelor, Broken Top and the Sisters range. Once you are ready to venture further to more difficult trails ,like Edison snow park, check with the local winter recreation shops for updated trail information. Home to 14 different sno-parks such as Skyliner and Swampy Lake, Central Oregon is the place to snowboard, nordic ski, snowmobile, and generally frolic in the snow.